Senate President Troy Jackson stands at the front of the Maine Senate chamber. Photo courtesy Maine Legislature website. 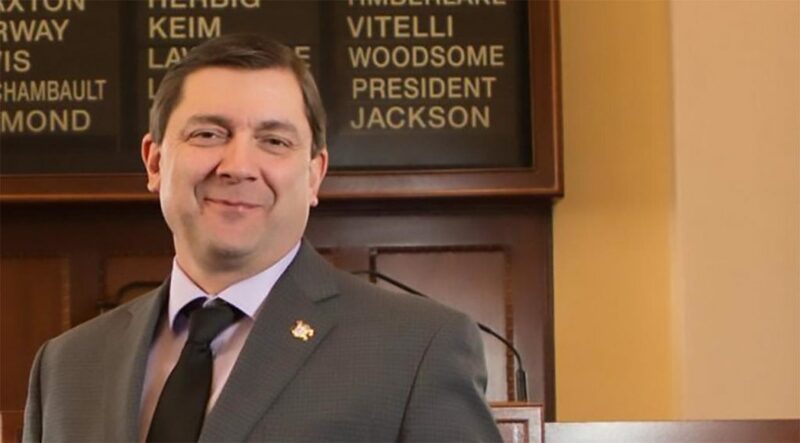 AUGUSTA – Language in a bill just introduced on April 9, 2019 in the Maine Legislature by Senate President Troy Jackson would hand the Commissioner of the Maine Department of Labor or any bureaucrat the Commissioner deems to be their “designee” a surprising amount of power over Maine’s small businesses. The language in L.D. 1524 (click here), sponsored by Sen. Jackson, gives the Maine Labor Commissioner or the commissioner’s designee the power to issue what appears to be a virtually permanent stop-work order on businesses and organizations that might just have simple mistakes on their employee payroll, with little to no opportunity for the business to remedy the situation or appeal. Maine law already allows for a worker who feels their wages are being stolen to file suit to collect regular and overtime wages for a period as long as two to three years, with most employees being able to collect interest, additional wages and legal fees in the event of a successful claim. Jackson’s bill, however, ups the ante for not just employers but for every worker who depends on that business for their paycheck. A non-profit organization that is monitoring proposed legislation that affects Maine’s workers and small business community says Jackson’s proposal puts workers and employers both at risk. We should always ensure that workers are paid what they have earned. But this bill gives unlimited and undefined authority to the Department of Labor to shut down businesses, putting all the employees out of work for a wage issue that might only affect one or two workers. Mainers shouldn’t lose their jobs due to government overreach. “We should always ensure that workers are paid what they have earned. But this bill gives unlimited and undefined authority to the Department of Labor to shut down businesses, putting all the employees out of work for a wage issue that might only affect one or two workers,” said Julie Rabinowitz, Director of Policy and Communications at the non-profit Maine People Before Politics and former Director of Policy, Operations and Communications at the Maine Dept. of Labor. “Mainers shouldn’t lose their jobs due to government overreach,” added Rabinowitz. Jackson’s bill references any violation of the “Wages and Medium of Payment” portion of Maine’s labor laws as “wage theft.” That opens the door for a small business to be accused of “wage theft” for a simple payroll mistake or confusion that is not rectified within a regular payroll period under state law. Jackson’s bill references several other chapters of Maine law, saying his proposal is in addition to those laws, which already protect workers from any attempt by the employer to avoid paying the wages, either as they continue their employment or for the final payment of wages if their employment ends. Those laws require payment to current employees or those whose employment have ceased in a timely manner and provide legal remedies to allow workers to collect the amount of wages owed, interest, up to two times the wages as “liquidated damages” and reasonable fees if their employer or former employer for does not pay them the wages they are owed. The federal government’s Fair Labor Standards Act also provides some protections for worker wages. Stop-work orders are typically used across the nation in situations where employers have failed to secure workers’ compensation for their employees or for serious safety violations, with most laws providing clear pathways to restarting work within a matter of hours or days if the employer suitably remedies the situation. It is unclear if any state or locality allows for the permanent or indefinite closure of businesses for disputes over wages via stop-work orders. Senate President Jackson is the only sponsor of this bill according to the Maine Legislature’s bill tracking website.